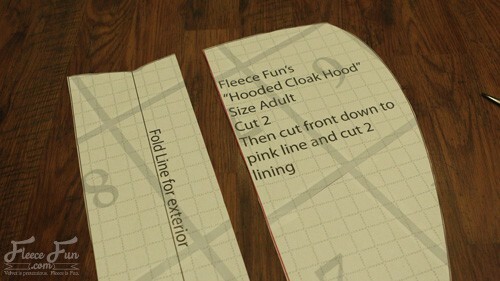 Free Sewing pattern: This Long Hooded Cloak Pattern is easy to make and is free! 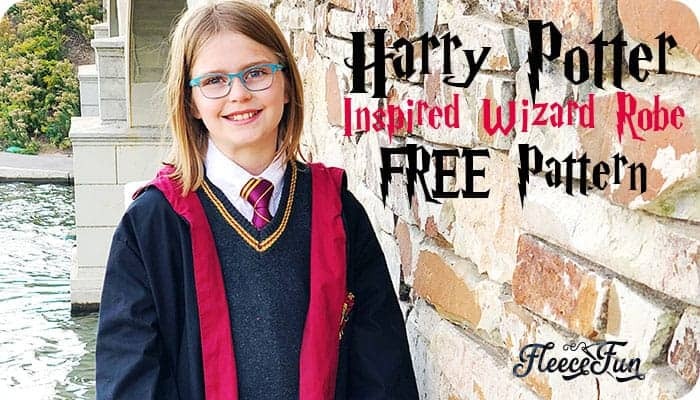 Video tutorial makes it easy to sew.simple seams and great for a variety of costumes. 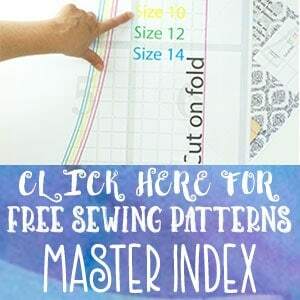 Perfect sewing project and beginner friendly. 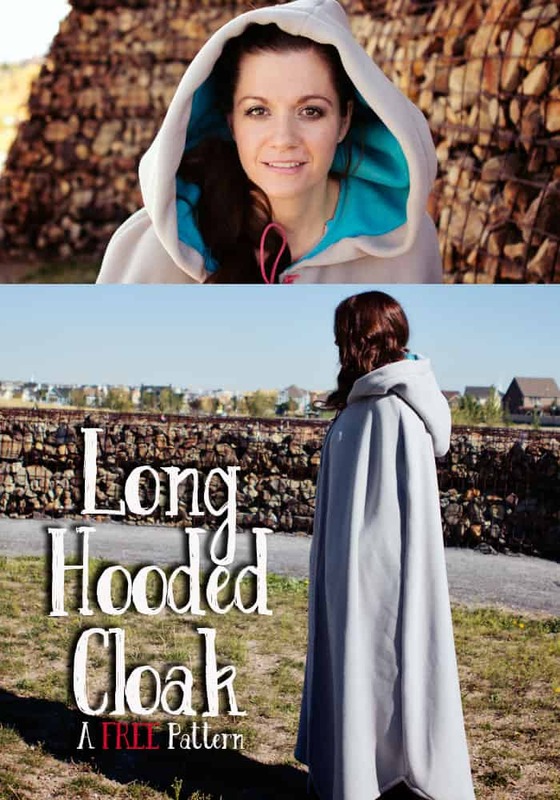 This long hooded cloak pattern is easy to follow and is perfectly priced at free! It’s easy to sew up ( honestly the longest part is assembling the pattern). It has a couple of different lengths and is sure to add a little drama to any costume. You will need to assemble the pattern. For instructions on how to assemble the pattern click here. 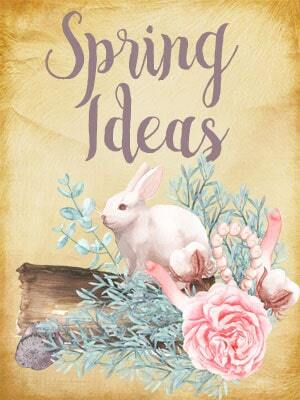 Normally I would just have this be a little blurb and then tell you what to cut out, but I need you to understand that this pattern is a little different – and so you REALLY need to pay attention to this part. To save you from endless pattern assembly the Long Hooded Cloak Pattern piece doubles as the back piece and the front pieces (yay for saving trees). 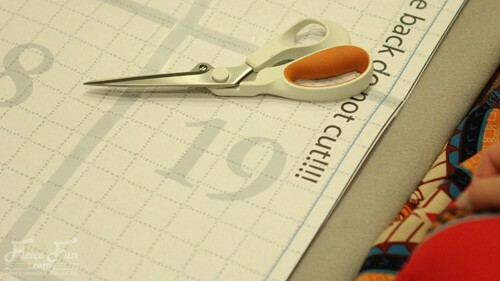 However this means that you need to do a couple of different things when you cut out the pattern. I’ve sewn for 2 decades and have never come across a designed like this = so even if you’re a seasoned sewist you need to pay attention. 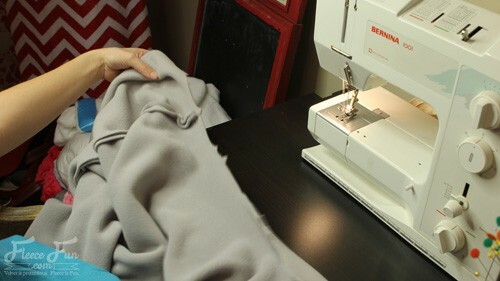 Each Long Hooded Cloak Pattern piece is actually 2 pattern pieces – you will cut down the pieces to make it the next pattern piece ( for example you will cut out the exterior of the hood, cut down the pattern piece and then cut the interior). 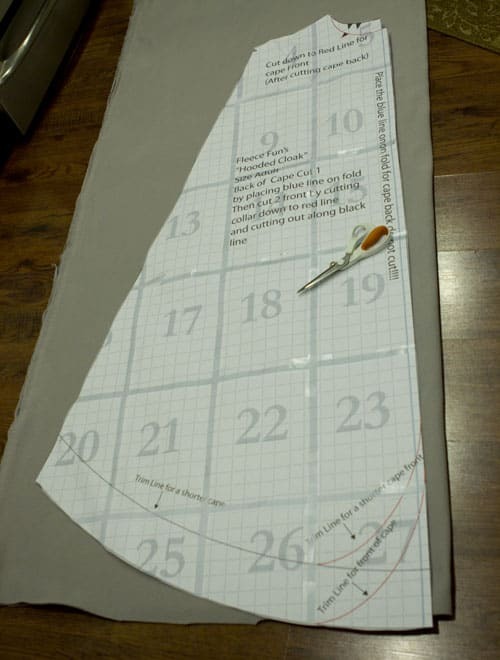 Cut the pattern to the length you want (there are two – I’m 5’4″ and the shorter length was good for me). 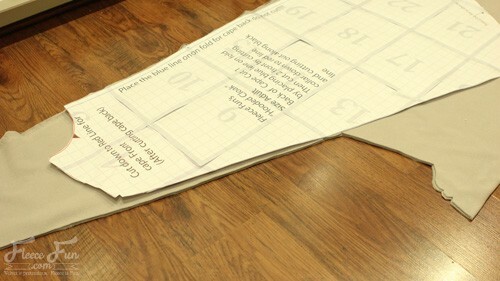 Now Cut the pattern piece to become the front piece. Cut on the red lines at the neck, and at the bottom (curve up so you don’t trip on the cape). Then place on folded fabric making sure ENTIRE pattern is on the fabric (no paper lip hanging over). Cut out pattern making two pieces for the front. Note: to conserve on fabric I turned the pattern around – this might not work with some patterned fabric. On doubled Fabric, cut two of the hood exterior. 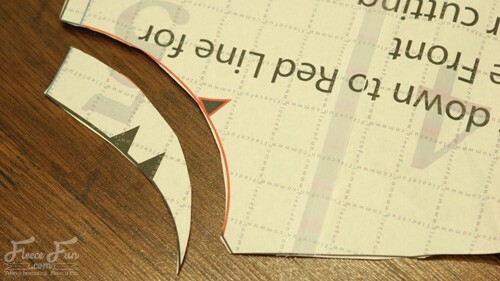 Then cut down pattern piece on the red line. On doubled fabric cut two of the hood lining. Assembling the bottom part of the cape is easy. Repeat this same process with the left side of the cape. Set bottom portion of the cape aside. 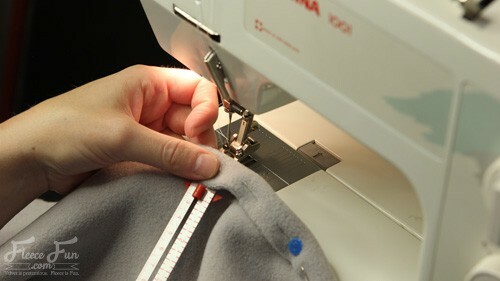 Step 5 – Sew the exterior to the hood lining. 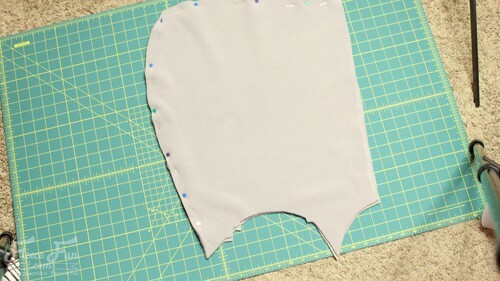 With right sides together sew the two exterior pieces together using a .5 inch seam allowance. Clip around Curves to help hood lay properly. 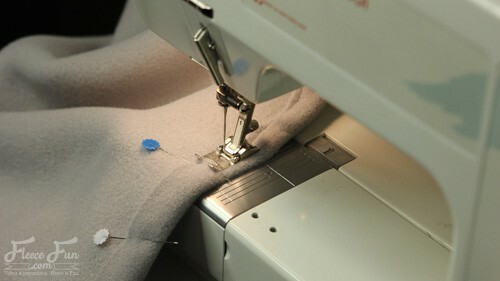 Pin the front of the exterior to the front of the lining right sides together, from collar to collar. Sew together using a .5 inch seam allowance. 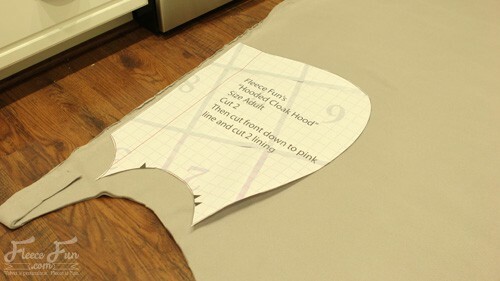 Turn right side out and tuck the lining back into the hood, making a nice rim of the exterior fabric on the interior side of the hood. Pin in place. Stitch in the ditch to hold the hood in place around the front of the hood. 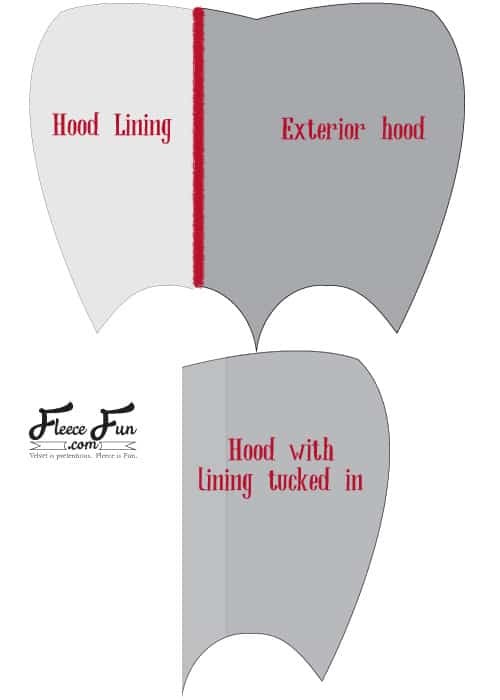 With exterior of the hood touching the right side (exterior) of the cape, pin hood to cape, using notches as a guide. 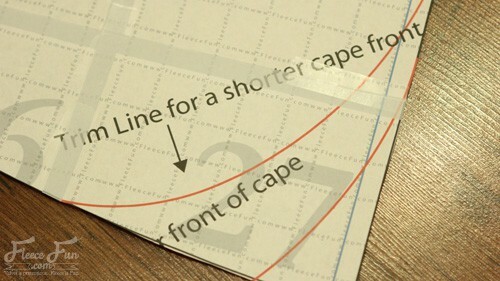 Note that the front of the cape should extend about .5 inches from either side of the hood. 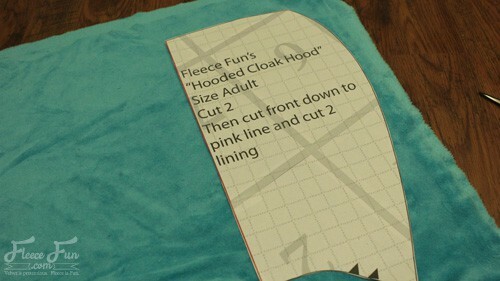 Sew hood onto cape using a .5 inch seam allowance. 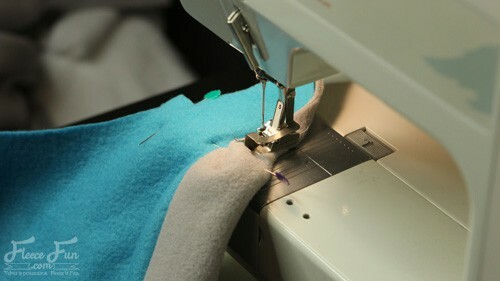 If desired top sew .25 inches from the seam at the bottom of the hood, to help the seam lay better. 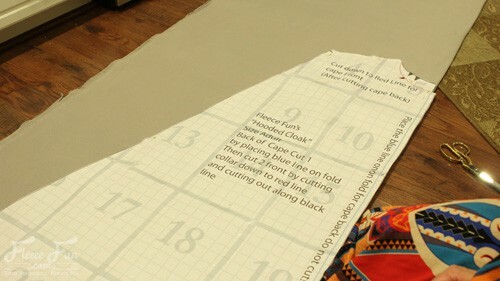 Step 7 – Finish off the cape. 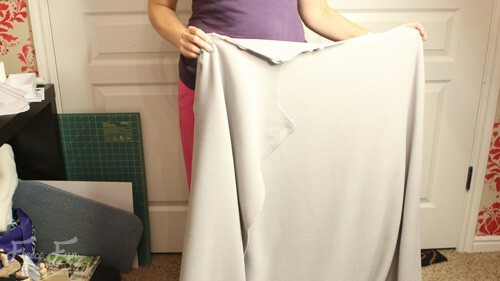 You can leave the fleece edges raw if you desire, but finishing them off can give the cape a nice look. 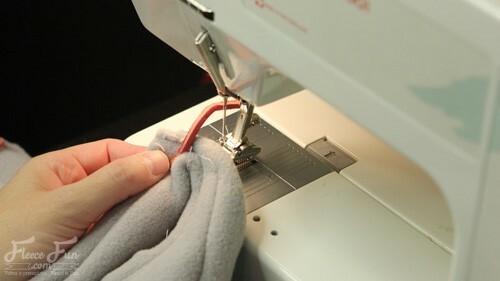 either using a zigzag stitch on the edge or a straight stitch near the edge. Sew on leather ties and your finished! You can check out all of my cape and costume patterns here.